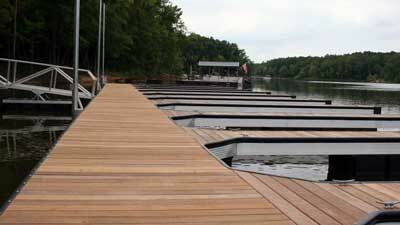 Your new dock deserves the best decking. Here we have organized our most common decking choices with a short description of each and an accompanying chart detailing the average ratings of each decking in a variety of categories. GutterDeck Waterproof Aluminum Decking – GutterDeck is an interlocking aluminum decking system with textured powder coat painted for durability, aesthetics and traction. Extremely lightweight and strong, very low maintenance and much cooler than traditional decking materials. See more at GutterDeck.com. Ipe Brazilian Hardwood – Forestry Stewardship Council approved, sustainably harvested natural Brazilian hardwood. Ipe is an extremely dense tropical hardwood with natural disease, rot, mildew and bug resistance. No chemical treatments are required for this durability, and therefore no preservative chemicals can leach out! Azek Deck – Premium capped cellullar PVC decking with 17 available colors in 4 different collections, optional hidden fasteners, and limited lifetime warranty. Evernew PVC – Pure PVC decking with 2 available colors, standard hidden fasteners and limited lifetime warranty. KDAT SYP – Kiln dried after treatment southern yellow pine. KDAT offers a much lower moisture content than traditional treated lumber. This allows the decking to be painted/stained immediately, with excellent saturation. However, this decking is still subject to normal softwood decking issues.